Stick wax on a string — for imaginative, manipulative play and excellent tactile stimulation. Wikkies are non-toxic, non messy, unbreakable, and endlessly reusable sticky strings that children can use to trace patterns on paper or form into stick people, flowers, and more. Big Count Class Kit — The Wikki Stix Big Count Class Kit is perfect for group projects! 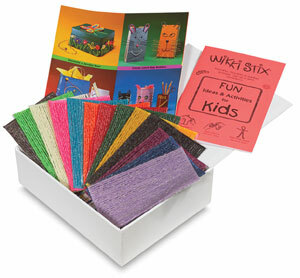 This class kit includes 468, 6" long Wikki Stix in 13 colors inside a cigar-style box. Colors are Light Blue, Navy Blue, Black, Brown, Forest Green, Lime Green, Orange, Pink, Purple, Red, White, Yellow, and Lavender. The kit also includes idea sheets and an Arts and Crafts Booklet, plus you can decorate the box!  Wikki Stix is a trademark.